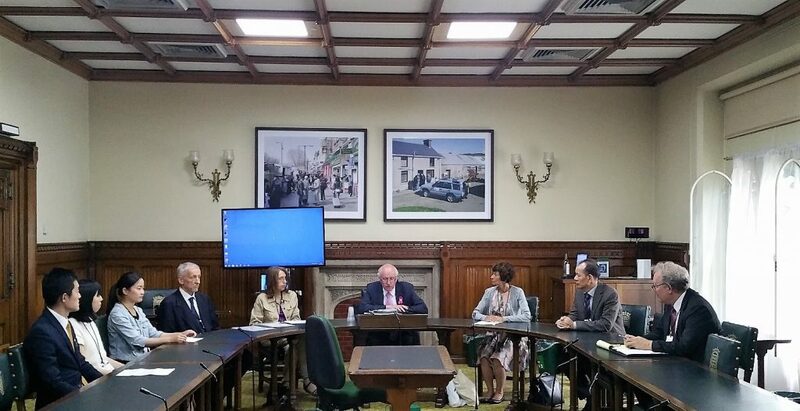 On Tuesday 17th July 2018, Jim Shannon MP, Chair of the APPG for International Freedom of Religion or Belief, hosted a seminar to mark 19 years of arrests, detention, torture and killing of Falun Gong practitioners because of their faith. The human rights abuses continue unchecked as China persists with its national policy to eradicate Falun Gong. Falun Gong (or Falun Dafa) is an ancient Buddha school practice based on the principles of truthfulness, compassion, and tolerance. In China tens of millions of people practise this peaceful faith and have become the largest single group of prisoners of conscience in China, if not the world (according to the NGO Freedom House). Nobel Peace Prize nominee Ethan Gutmann estimates 450,000 to a million Falun Gong practitioners are detained at any given time. For up-to-date information I recommend the new report “Cold Genocide: Falun Gong in China” published in Genocide Studies and Prevention: International Journal; Volume 12, 2018. Allegations that Falun Gong are being killed for their beliefs and harvested for organs will be discussed at the Third Round Table Briefing in Parliament on organ harvesting in China, which Jim Shannon MP will be Chairing alongside Fiona Bruce MP, on October 16th 2108 at 2pm. Please contact us if you’d like an invitation. This persecution directly affects the lives of many Falun Gong practitioners living in the UK who have family in China imprisoned for practising Falun Gong. They urgently need support and help. Director and Spokesperson of the Falun Dafa Association UK. For 19 years she has campaigned for the end of the persecution of Falun Gong practitioners in China. Academic Director of the Brigham Young University London Centre and Senior Fellow for Comparative Law and International Policy at the BYU Law School International Center for Law and Religion Studies. Senior lecturer in mental health at King’s College London. He has a keen interest in social history, and has written two books: The Moon and Madness (2011) and Echoes from the Corridors: the Story of Nursing in British Mental Hospitals (2016). Niall is a regular writer for Salisbury Review and various political websites. Professor at Johannes Gutenberg-Universitat, Mainz, Germany, a board member of China Organ Harvest Research Centre (COHRC) and a co-author of the 2018 COHRC report. He has published articles on transplant abuse in China in medical journals, including The Lancet, British Medical Journal, and BMC Medical Ethics. He has been invited to speak on this issue at the European Parliament and parliaments of European countries. Huige studied medicine in China and earned his doctoral degree in 1997 at the Johannes Gutenberg University of Mainz. He was appointed as Professor of Pharmacology in 2011 at University Medical Center of Mainz, Germany. He has published over 100 scientific papers with over 6,000 citations. Human rights activist and writer; founder and Chair of Hong Kong Watch, and East Asia Team Leader at Christian Solidarity Worldwide. Deputy Chairman of the Conservative Party Human Rights Commission, which he co-founded and also a member of the advisory board of the International Coalition to End Transplant Abuse in China. Additional speakers include personal testimonies from Falun Gong practitioners who have been persecuted for their faith. Minghui Yu (Amy): is from Heilongjiang Province in northeast China. She came to the UK in 2010, graduated BA in Fashion Design from Anglia Ruskin University and is studying bespoke tailoring at Savile Row Academy. In 2016 Amy spoke in Parliament about her ordeal as part of Ride To Freedom, who were raising awareness about the plight of Falun Gong orphans. Xiaotong Qin: is from Guangxi province, China. She came to the UK in 2016 and studied Statistics in the University of Manchester. Her family has been persecuted since 1999. Her mother is still being persecuted for her faith. Zhen Bai: studied at Royal Institute of British Architects and has gone through persecution since 1999 with family who have been forcefully transformed and are still suffering from the brain wash from the current Communist Party. If you would like to see any of the full speeches, please email here.